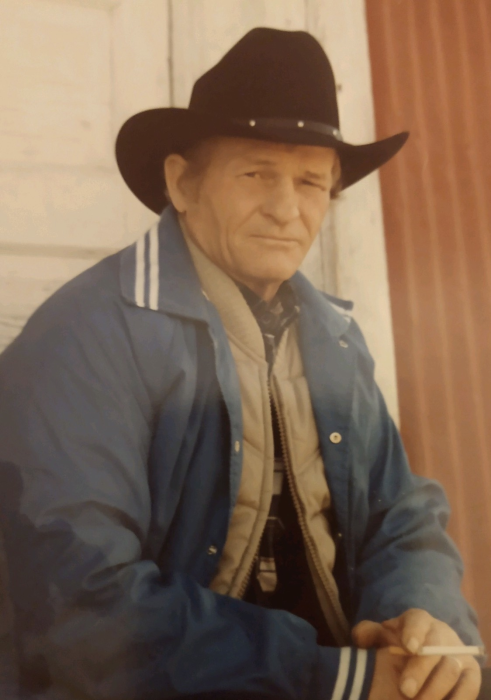 Donald Eugene Garner, 89, passed away Wednesday, November 7, 2018 at Scottsbluff Care & Rehabilitation Center in Scottsbluff, Nebraska. Don was born August 18, 1929 in Eli, Nebraska. He was the third of six children born to Jesse Lee Garner and Clara Opal Weatherill. Don was a real cowboy and spent his childhood working on the Garner ranch on the Niobrara. He married Loina Evelyn Fair April 25, 1948. Don started working construction and helped build several highways throughout Nebraska and South Dakota. Don and family gradually moved across Nebraska, to the Black Hills, and then finally Sioux Falls, SD in 1965 where he began his career as a truck driver. Don got re-married to Gloria Jean Loose in 1984 and eventually moved back to Nebraska in 1993 after buying land at Lake Minatare. He continued driving truck until he retired in 2011 at the age of 82. Don loved animals, especially his beloved dogs, or potlickers as he liked to call them. He played harmonica and yodeled to pass the time in the truck, and eagerly tried to get the dogs to sing along with him. He was a self-proclaimed “Nebraska Pioneer”. He loved watching his grandson, Clint, drive sprint cars. He passed the time most days watching Forensic Files and Bonanza, and driving the lawnmower to get the mail. He enjoyed “helping” his son Dan bale hay by driving the tractor. He was the orneriest, but most lovable, old trucker you could ever meet. He loved his children and their kids immensely, and was actually very tender-hearted. There was no look like the one he had for his kids. It was like he looked into their souls and said, “I’m your dad and I love you”. Don is survived by his wife, Gloria; sons Terry (Tekabe), Sioux Falls, SD, Dan, Douglas, WY, Randy (Jolene), Sioux Falls, SD; daughters, Nila, Eugene, OR and Kristi Walters (Corey), Wilmington, DE; grandchildren, Jason Goecke, Renee Van Dyke, Justin Garner, Dawn Coombs, Crystal Crawford, Mike Edison (step-grandson), Kathy Hamre, Shelly Frederickson, Clint Garner, Matt Garner, Brad Garner, Brian Franke, Rob Neumiller, Andrew Neumiller, Svetlana Neumiller, Molly Garner-Puff and Dylan Garner; and numerous great-grandchildren, two great-great granddaughters, nieces and nephews. Don was preceded in death by his parents; siblings Nyal, Rosie, Mary Ann, Jesse and Janice; and grandsons Timothy Garner, Tige Garner and Robbie Edison (step-grandson). A Life Celebration will be held on November 14, 2018 with a luncheon at 12:30 pm at the Eli Community Center, followed by a service at the Eli Community Church at 2 pm in Eli, Nebraska. Don will be buried at Conley Flats Cemetery, surrounded by his grandparents, parents, aunts, uncles, and siblings. In lieu of flowers, a donation in Don’s honor can be sent to the Panhandle Humane Society of Scottsbluff.